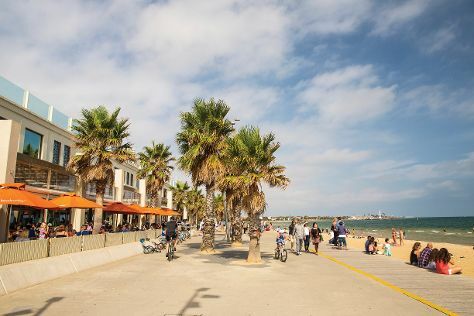 You'll get in some beach time at St. Kilda Beach and Half Moon Bay. Head to Melbourne Central and The Australian Natural Soapfor some retail therapy. Take a break from Melbourne with a short trip to Koala Conservation Centre in Cowes, about 1h 35 min away. And it doesn't end there: take in nature's colorful creations at Royal Botanic Gardens, enjoy unforgettable views with a balloon tour, contemplate the long history of Old Melbourne Gaol, and get a taste of the local shopping with Degraves Street. To see where to stay, traveler tips, photos, and other tourist information, read our Melbourne tour planning app . Napier, New Zealand to Melbourne is an approximately 9.5-hour flight. You can also do a combination of bus and flight; or do a combination of bus, taxi, and flight. The time zone difference when traveling from Napier to Melbourne is minus 2 hours. Expect a daytime high around 30°C in March, and nighttime lows around 15°C. Wrap up your sightseeing on the 23rd (Sat) early enough to travel to Adelaide. Do your shopping at Adelaide Central Market and Rundle Mall. Go for a jaunt from Adelaide to Carrickalinga to see Carrickalinga Beach about 1h 10 min away. Dedicate the 25th (Mon) to wine at some of the top wineries in the area. There's much more to do: look for all kinds of wild species at Cleland Wildlife Park, steep yourself in history at Adelaide Oval, and explore the world behind art at Art Gallery of South Australia. To find where to stay, photos, reviews, and tourist information, go to the Adelaide trip planner . You can fly from Melbourne to Adelaide in 3.5 hours. Alternatively, you can drive; or take a train. In March, plan for daily highs up to 30°C, and evening lows to 18°C. On the 26th (Tue), you'll have the morning to explore before heading back home.